IndyCar heads to NOLA Motorsports Park this week for the inaugural Indy Grand Prix of Louisiana. Juan Pablo Montoya has the early points lead over Will Power and the rest of the Penske crew who currently hold four of the top five positions in the points standings. Qualifying is scheduled for Saturday at 5:15 p.m. EDT and the green flag waves on Sunday at 3:37 p.m. EDT. At St. Pete Penske proved that they are the team to beat this year. They led sessions throughout the weekend and nearly swept the top four places during the race. Tony Kanaan of Chip Ganassi Racing broke up the Penske team with a third place finish. Being that the Indy Grand Prix of Louisiana is a new event this year, the only time drivers have run on this course is during pre-season testing at the track which took place in March. At the test, Scott Dixon posted the fastest time of the day with a 1:18.140 lap. Will Power and Juan Pablo Montoya were just .05 and .250 seconds behind him, respectively. The latter will be looking to claim his second win of the season on Sunday. Then, unlike what we saw at St. Petersburg, we had a Honda finish in fourth position. Graham Rahal posted a 1:18.353 in his Honda powered and aero kit equipped machine and slotted himself into the top five. Chevrolet seem to have the early advantage over Honda, but it is still early. With rain expected for qualifying and the race, things could get quite shaken up this weekend. Don’t be surprised if a wet race causes Honda and Chevy to run closer together this weekend. Other than that, there’s not much to discuss with a new race on the calendar. There are chances of rain and thunderstorms all throughout the weekend and the temperature warms up for qualifying and the race. For more information about the forecasting process, you can view our interview with Doug Schneider of RaceCast Weather here. 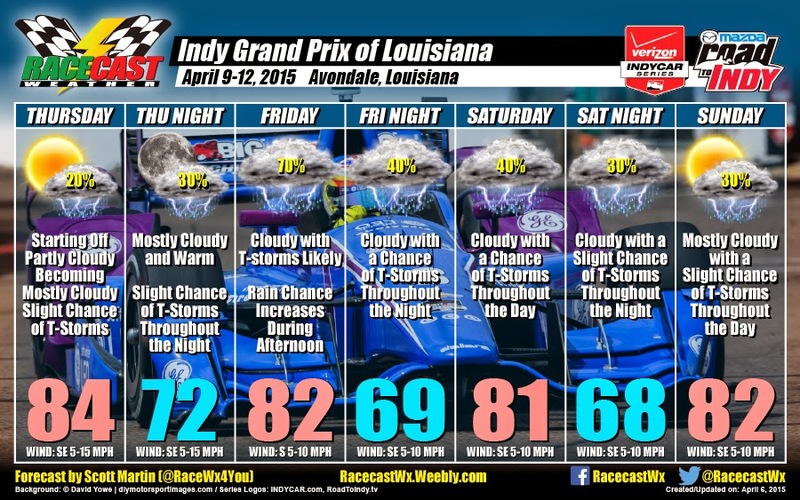 Sunday’s race at NOLA Motorsports Park is the inaugural Indy Grand Prix of Louisiana. It’s a blank canvass for drivers to make their mark on the track in the Verizon IndyCar series. Who do you think will win in New Orleans? Can Montoya win his second race this year? Let us know in the comments below and vote in our pole here.